Extinction is the third paid DLC expansion pack for ARK: Survival Evolved. Extinction was released on November 6 for PC and released on November 13th for Xbox One and PS4, and is available for purchase through the Season Pass. Extinction places survivors on an Element-infested, ravaged planet filled with fantastical creatures both organic and technological. Earth holds both the secrets of the past and the keys to its salvation. Eclipses that temporarily dim the light. Geysers that launch survivors and Creatures into the air. Meteor showers where meteors rain down upon the land and destroy structures and kill Creatures. Orbital Supply Drops that fall from the sky and Element Nodes that rise from the ground that, when activated, start PvE horde-styled events. This map, set on Earth rather than an ARK up in space, forces players to survive an Earth unfamiliar to us: one of strange features and stranger creatures. 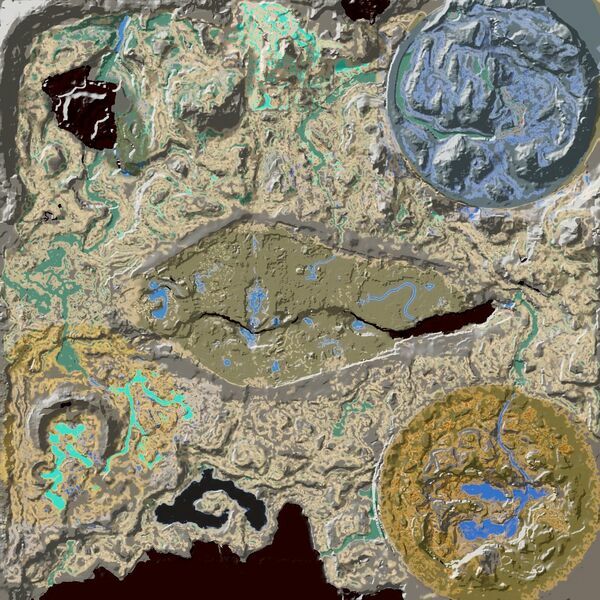 In the center of the map lies an abandoned city, usually referred to as the Great City or Sanctuary. It is the remains of some great technologically advanced civilization, the same one that built the ARKs. Outside of the city borders, pockets of life can be hard to find among the corrupted wasteland. They are still there, however, in the protective borders of the Proto-ARKs. To the south, the desert Proto-ARK exists. To the north, the Snow Dome, a second Proto-ARK. Another exists to the northwest, called the Sunken Forest, which was supposed to be another ARK but failed when it collapsed into the ground, presumably due to there being a large sinkhole underneath it. Strangely enough, the Proto-ARKs represent past challenges the survivor has faced: the Sanctuary and Snow Dome vaguely representing The Island, the Desert Dome representing Scorched Earth, and the Sunken Forest bearing similarities to Aberration. Despite being called 'dead' this Earth may be more alive than we first thought, but with life we don't understand. Corrupted Earth features several new resources as well as existing ones from previous DLCs. Some of these resources, such as Blue Crystalized Sap and Silicate serve as substitutes for other resources. Corrupted Earth contains several inactive structure drops known as Orbital Supply Drops and Element Nodes. This new feature requires all survivors with their tamed Creatures to fend off against waves of Corrupted Creatures to obtain the items left behind inside, in the form of PvE style raid. The in parts irregular outer boundary of the map is indicated with poles bearing red lights at the top. Crossing the outer boundary of the map will, unlike in the other maps, instantly kill you and your tamed creature. Corrupted Earth contains living creatures. The corruption of Element has led to turning most of the Creatures into a variant known as "Corrupted" which roam around the earth. Due to the over-exposure of the Element, their minds and bodies have become too Corrupted to be tamed like their original counterparts, and must be killed on sight since not only will they destroy anything non-corrupt in their way, their minds moves in a "hive-mentality" state which makes any previous Temperament they were known for redundant. These include creatures like the Corrupted Wyvern from Scorched Earth and the Corrupted Rock Drake from Aberration. Moreover, these Corrupted Creatures react to activations of Orbital Supply Drops and Element Nodes, causing them to amass against the tribes who activated them in waves and will attack not only them, but mainly the activated drop as well. However, not all creatures mutated by the Element submit to its "hive-mentality". Some creatures, such as Gasbags still retain its normal temperament, thus allowing survivors to tame them despite their state of appearance. Several giant minibosses, known as "Titans" roam across sections of the map accessible through dungeons/caves once their following prototype Obelisks are activated. They are extremely aggressive, but survivors who managed to knock it down will be able to tame the savage beast temporarily. Within Earth lies technologies like the Enforcer and the Scout. While these new Mechanical Creatures cannot be tamed like organic beings, they can be crafted by survivors with parts from destroyed Creatures and blueprints from Orbital Supply Drops to build them as part of their tribe. Gacha Crystals - special Gacha Crystals provide armor, weapons and sometimes structures, but do not contain saddles, but this is the easiest and safest way to obtain said items. Cave Loot Crates - the three caves, Desert Cave, Forest Cave, and Ice Cave host a number of high-level Loot Crates containing weapons, armor and saddles. Orbital Supply Drops - defending the waves of Orbital Supply Drops and securing the loot provides armor, weapons, structures and Tek Tier items exclusive to Extinction, such as Cryopods. Defeating the Titans ( Desert Titan, Forest Titan and Ice Titan) provides survivors with valuable loot. Mantis is untamable in Extinction as they can only be found at caves where creatures are not tamable. Hesperornis was made tamable due to spawn addition outside the caves as of patch 294.101. As Extinction is part of the story of the ARKs, Explorer Notes can be found across the map. These Explorer Notes document the ARK lore. For more in-depth information, see Explorer Notes. In addition to the Explorer Notes, Dossiers can also be found on Extinction, written by Helena Walker to document the research of the Extinction's creatures. For more in-depth information, see Dossiers. Unlike the main game and the previous DLC Scorched Earth and like Aberration, this expansion pack includes mainly non-existent creatures from fantasy. (e.g: Managarmr, Velonasaur and Gacha). This page was last edited on 19 April 2019, at 13:36.